Can we customize this at all? I have an order tracking spreadsheet that I currently use. It uses a Google query in the URL to show only rows based on client information they submit. 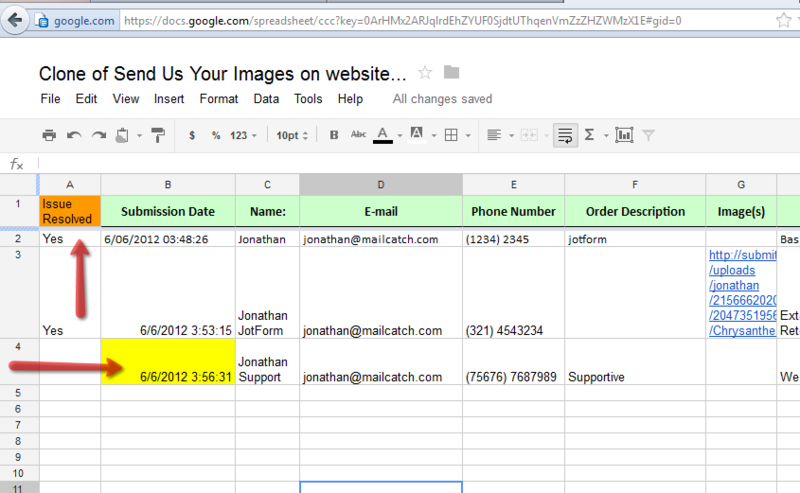 As orders come in through jotform I manually enter them into my Google spreadsheet. Users can then enter their account number and see all active orders they have submitted. I would love to be able to customize the way Jotform integrates with the spreadsheet and even better, have it add to my current document. This is a re-post of a comment on Google Docs Integration: Send Responses to Google Spreadsheets. Instantly. I do not think that you can change the way JotForm integrates with Google Docs. However, your integrated spreadsheet is fully customizable itself, you can delete/add some columns, use formulas and so on. If you need to import data from one spreadsheet to another you may try ImportRange Google Docs function. When you say that you can add/delete columns in your document - how does this affect future submissions? For instance if I add a column before the current column A ("Submission Date") and label it "Issue Resolved" or something like that. The next time someone submits a form, is it smart enough to put the Submission Date into column B now, or will it post it in the same place as before? I tried it out and it looks like it is smart enough to put new submissions where it should go. Should have tried before asking, but maybe this will be helpful for someone like me later that reads this post. I confirm that this functionality with jotform and google integration is working. The key here is the column names use in the spreadsheet. As long as you do not change the column name created on the spreadsheet when the form was integrated, all succeeding submissions will still map the appropriate fields even if you move the column number (by adding/inserting new columns). Here is a screen of my test, wherein I appended the new column "Issue Resolved" right before the 1st original column (Submission Date). As you can see I was able to submit the last data (3rd row). Feel free to contact us again anytime should you have other inquiry on JotForm. Thank you for your response. I have one other problem with customizing the Google Doc spreadsheet however, It seems that whenever I edit the form it creates a new spreadsheet rather than updating the old one. This can be rather annoying since I have added sheets to the old form which generate graphs based on the data (to make up for short comings in JotForms reporting). So if I edit the form, I have to transfer all the customizations that I have done on the Google doc sheet to a new sheet. Is there something I can do to avoid this? As a note - prior to the official integration I was already getting JotForm results into Google Docs with the "=importHTML("http://www.jotform.com/table/XXXXX", "table", 0)" command by creating an HTML table report for the form. This worked reasonably well, but I was hoping that the Jotform integration would make things easier to set up. i haven't experinced that with my form. Did you change the title of the form or anything? No. Oddly I have three forms in Google docs now with the exact same name (didn't think that would be allowed). I changed the form a few days ago and then again yesterday and the old spreadsheets stop having data as of the day I edited the form. Did you add sheets to your form, or just edit the main sheet? I was able to reproduced the behaviour in the integration that you mentioned about. Everytime you edit the form(i.e. changed field names) that is integrated already to google spreadsheet, a new instance of the spreadsheet of the same name will be created. And will prevent succeeding submissions from reflecting into the original spreadsheet. BUT just the same, you still get all the data/information on the new spreadsheet (so we actually do not loose any info/data). Can we accept that this behaviour is just right? I mean, since you edited the form, it is only appropriate that a new spreadsheet/report should be created for it. After all it is now a different form due to change in information required (changed field/questions). This makes the forms and spreadsheet reports easy to manage because you will be able to manage/track the historical/changes made on the form base on the number of instances created. In essence you actually have an audit trail already. Thank you for considering our service. Please inform us if you have further inquiry/suggestion you like to share with us. I suppose that I can see the point you are trying to make, but this renders the integration feature completely useless for me. The whole reason that I am trying to use Google Doc is that I can do more live reporting than JotForm currently supports (which if it supported better I wouldn't even need to try). Here is an example of what I'm doing with Google Docs - I'm trying to track the number of responses received over time. So, I have my spreadsheet which tracks the responses. Within that spreadsheet I have some formulas that count how many responses were receieved each day and each month and I generate two graphs. I use an html page to display 3 JotForm 'visual reports' and then the graphs from the spreadsheet so everything appears nicely together. Now, I go in and add an extra field in my form because I realized that we need to track something in addition to what we were tracking before. But this now generates a new spreadsheet in Google Docs which doesn't have my formulas. My html page references the graphs from the old spreadsheet, which is never updated. Now I have to copy all my formulas into the new spreadsheet and regenerate my graphs. Then I have to go to my html page and have it point to the new graphs instead of the old ones. Maybe not to bad if I only have two graphs, but still a pain and certainly bad if I am doing a lot extra as I intend to do. So I don't know that I can agree to say that it works 'just right' from my perspective, but I can see your argument. Even if it did update my spreadsheet, but changed the order of columns it could disrupt my formulas and cause me some rework. That is just the nature of trying to find a custom solution to an unsupported feature. I guess JotForm is more designed with the mentailty that once you have a form and 'launch' it, you don't intend to change it. This is true of the reports as well. If you add a field you have to regenerate all your reports (whether RSS, Grid view, HTML, etc.) in order to represent the new field. Which is not to say that this is the wrong way to look at things, but I suppose I am trying to use your tool in a different way then you were intending. I suppose I could have gone with a survey software instead of a form tool and better achieved my end goal - at least on this particular application. I chose JotForm because I hoped it to be versitile to handle both mentalities, but I guess I'm just trying to make it do more than it was designed for. But overall I have been happy with what I've been able to do with it. Mostly I just wish that reporting was improved. It just seems like that is not a high priority. I understand your point very much as well. And I know this for sure -- that all my colleague who can view this post will share the same appreciation I have on the feedback information you shared with us. I guess the functionality that is suitable for your requirements is indeed a feature that is not yet available on the out-of-the-box integration of JotForm to google spreasheet. Considering that the integration feature is still relatively new until now, perhaps future rendition of this integration feature will be able to include the functionality need such as yours. I will create a separate post and ticket for this feature/functionality on google integration using your reply to pass this helpful information to our dev team so they can consider this among the feature lists. Perhaps they can apply this sooner than expected. As for the current status, I can only suggest that -- indeed you have to "at some point" finalize your form(at least =:) ) and re-integrate, re-apply the formulas, and use it again to your live reporting. Thank you very much for such informative and helpful input. One thing I will say is that JotForm does an excellent job of allowing for cutsomer feedback. Even though I may not like it when I get 'That feature is not high on the priority list' at least I know that I've been heard and that you are aware of my concerns. So, keep up the quick responses! This is assigned to one of our Developers and marked as nice to do, however, there is no ETA for now. I have also added your vote to the mentioned feature request ticket. Thanks for the above thread- it was very helpful and I hope this feature is added as well! Hello! first of all: excuse my English, for I'm not native English speaker. I would like to know: precisely what changes in the form (or in the spreadsheet) cause the integration to create a new doc? We use your Google spreadsheet integration, because our company uses Google App Mail. So, I can share that spreadsheet with many different users and specify different levels of access (read-only / read&write). Users don't have to validate (user/pass), as they would have to do in JotForm because they have already open their Google Mail account. The main goal is to keep it simple for the final users. We also make some personalization to the spreadsheet, and have to re-do them each time the doc changes. Also, users have a link to the shared doc. Each time JotForm creates a new one, the get confused because they access a not-updated doc. And I have to apply the customizations to the new doc, share it (respecting the different levels of access) and send the new link. I hope you can give me a list of form changes that cause this issue, and -eventually- improve this functionality. PS: I've also read the other related thread. Your query can only be answered by our developers, and so we'll need to forward a report ticket to get their attention. For a more pleasant support experience though, we will have to ask you to open a new thread for your issue. We'll be looking forward to this new thread. Thanks! Can we manually enter rows of data to the integrated google spreadsheet? Sometimes I get resume's handed personally and sometimes they come through the signup form I have. I would like to add the data from the ones I have in hand to the spreadsheet. Will my manually entered data be overwritten when new submissions come in?